Unfortunately, my two attempts at this recipe were quite disappointing. 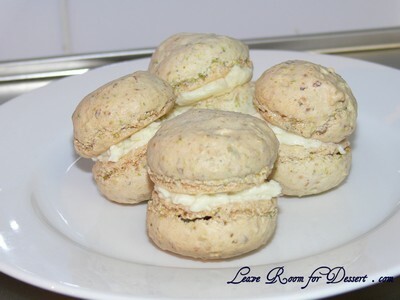 I had made macarons a few times before (not having perfected them…yet), so I thought I would manage quite well and hoped that this would be the perfect recipe and the macarons would look gorgeous. This was not the case. My macarons looked worse than all other trials – including my first one, when I didn’t even know what they should look like. The macarons didn’t form “feet”, didn’t have a nice crisp top – they just puffed a bit in the oven then the top dried a bit and they sunk back down. Fortunately they were still moist and tasted quite good. 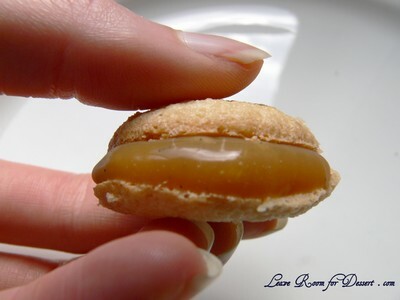 For the filling, I made salted caramel which had mixed reviews. Most people enjoyed it immensely, others found it extra sweet, and I just found the taste a bit strange, I think I’m just not a caramel liking person, unfortunately. I like butterscotch, flavours, so I’m not sure why I don’t like caramel? I made two batches of this recipe, as I thought the first time it mustn’t have worked because, perhaps I didn’t beat my meringue mixture enough (as it says stiff peaks and other recipes state glossy meringue), or that drying them out in the oven caused the problems that occurred. Neither seemed to be the cause, I decided to keep beating the meringue, but it just would not form a glossy meringue. Either I put my KitchenAid on too fast and over beat the meringue, added my sugar too late or there may not have been enough sugar to form the meringue, although I’m not totally sure. 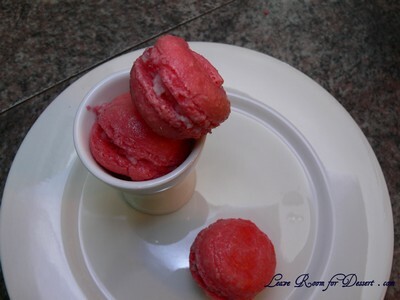 I have decided to share all my previous macaron experiences with you all, to give you an idea of problems I have had through each recipe, as well as give everyone suggestions for recipes they may or may not like to try. I never got around to posting these (apart from the latest one), as each had something slightly wrong with it (not necessarily the recipe, most are my mistakes while learning and trying to achieve the perfect macaron, inside and out). The following photo was my first ever attempt at macarons and was Nigella Lawson’s pistachio macarons from How to be a domestic goddess. 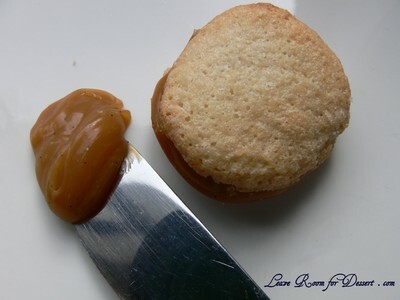 The recipe did not state to leave the macarons to form a skin, resulting in biscuit looking macarons. This flavour was beautiful and as I recall the inside texture was also lovely, with the only problem being the look. They had half the recipes’ pistachio buttercream in them (the full amount is way too much, like stated on many other blogs). After reading many more macaron tips, I had decided to trial out the pistachio macarons using Syrup and Tang’s French meringue method (replacing the almond meal for pistachio meal). After leaving them to sit for half and hour the formed quite lovely macarons that probably could have been beaten a few more times, for a better look and because they were a bit meringue-y still. Also – half almond, half pistachio may have worked better. I filled these with a rosewater buttercream. (For the buttercream: 25g butter, 1/4 cup cream, 1/2 cup icing sugar and 1/8 teaspoon rose water – beat the butter till soft and lightened in colour. 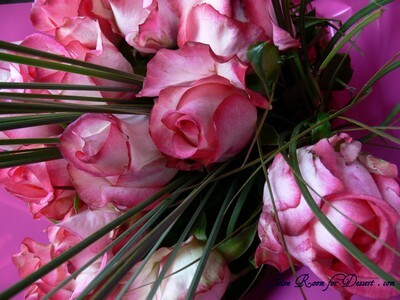 Beat in the cream, then the sifted icing sugar or mixture with the rose water). 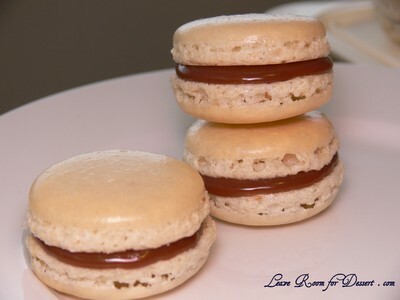 I had heard that the Italian meringue method was by far the most reliable and best around, I used Syrup and Tang’s Italian meringue method for these macarons. The two problems I had (apart from my enthusiasm with the pink food colouring) were the sugar syrup forming large chunks when drizzled into the egg white mix, as well as bumpy tops. The first problem may have occurred as my sugar thermometer didn’t reach into the sugar syrup, so I had to keep tipping the saucepan up to read the temperature. This disruption may be the cause of the sugar lumps. The second problem may have been able to be fixed by beating the mix a few more times. I would like to try this again as the inside was lovely and moist, filled the entire shell and seemed the perfect consistency. These were filled with white chocolate and raspberry ganache from Gourmet Traveller. 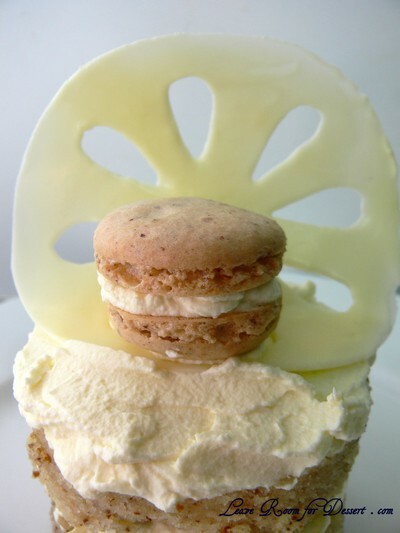 The recipe that produced the most beautiful macaron was Helen’s from Tartlette. Helen’s recipe produced a gorgeous glossy smooth top with pretty feet. 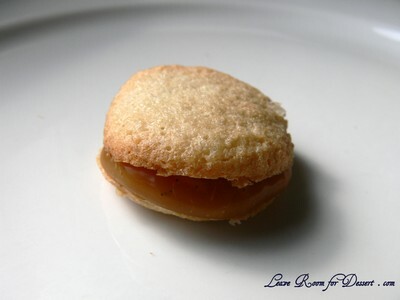 My only problem with these were a bit of a hole under the shell of the macaron – could this be an oven problem? I filled these with a simple chocolate ganache. 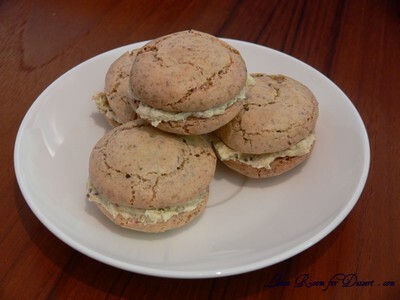 My latest trial were hazelnut macarons, which had a beautiful flavour, although were lacking slightly in appearance. Recipe adapted by Ami S from Claudia Felming’s The Last Course. Preheat the oven to 200°F (93°C). Combine the confectioners’ sugar and almond flour in a medium bowl. If grinding your own nuts, combine nuts and a cup of confectioners’ sugar in the bowl of a food processor and grind until nuts are very fine and powdery. Beat the egg whites in the clean dry bowl of a stand mixer until they hold soft peaks. Slowly add the granulated sugar and beat until the mixture holds stiff peaks. Sift a third of the almond flour mixture into the meringue and fold gently to combine. If you are planning on adding zest or other flavorings to the batter, now is the time. Sift in the remaining almond flour in two batches. Be gentle! Don’t overfold, but fully incorporate your ingredients. Spoon the mixture into a pastry bag fitted with a plain half-inch tip (Ateco #806). You can also use a Ziploc bag with a corner cut off. It’s easiest to fill your bag if you stand it up in a tall glass and fold the top down before spooning in the batter. 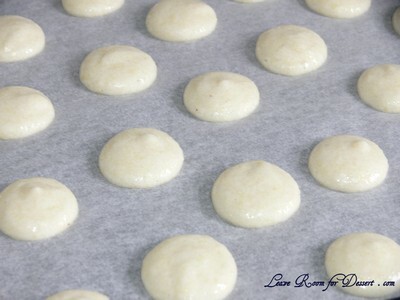 Pipe one-inch-sized (2.5 cm) mounds of batter onto baking sheets lined with nonstick liners (or parchment paper). 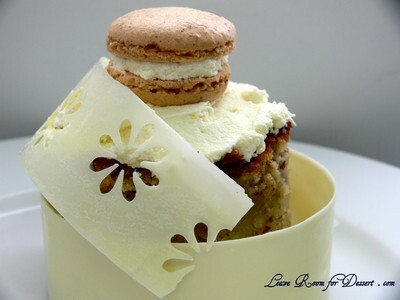 Bake the macaroon for 5 minutes. Remove the pan from the oven and raise the temperature to 375°F (190°C). Once the oven is up to temperature, put the pans back in the oven and bake for an additional 7 to 8 minutes, or lightly colored. (I also tried leaving them at room temperature for 30 mins at room temperature, bu they still didn’t rise like they should). Cool on a rack before filling. In a 1 litre heavy based pot, cook the sugar, stirring all the time to get an even caramel. Then add in the vanilla pod, scraped. Add in the warm cream a bit at a time as it will bubble up and splatter. Then add in the fleur de sel. Stir to make sure all the caramel has dissolved. Cool the mixture to approximately 40 degrees Celsius. Add in the well chilled butter, cut into cubes. 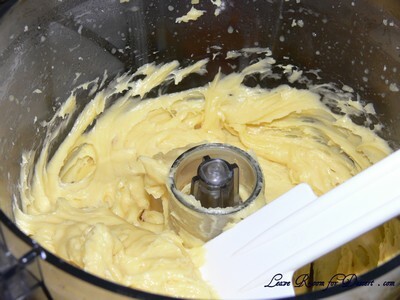 Using an immersion blender, blend in the butter till you achieve a smooth glossy paste. Line the surface of the caramel with plastic wrap or greaseproof paper to prevent a skin from forming and chill in the fridge until needed. I have quite a good memory when it comes to foods I want to cook. After watching an episode of Food Safari a year ago, we still hadn’t made one of the lovely Greek dishes we watched being made. Finally, we had the ingredients and I am so happy to have tasted this great dish. 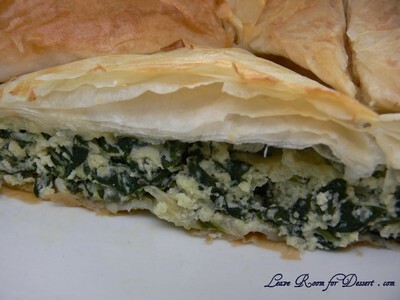 With layers of crisp filo pastry and melted butter, filled with feta, ricotta and spinach it was marvelous! Even for those who dislike spinach, I would suggest giving this a go. We had a few problems with the filo pastry getting stuck together, as we used the frozen pack of filo pastry, which just doesn’t pull apart as easily as the fresh packs. Although, once cooked, we couldn’t notice the tears of pastry in the layers. We’ve already made this again, and just a note – even if your spinach is a bit old and wilted, still use it – it still tastes great! Trim the roots from the English spinach, or if using silverbeet, remove leaves from tough stems. Wash leaves and drain well. Coarsely shred the leaves and tender stalks of the spinach and set aside. Place the feta in a large bowl and coarsely mash with a fork. Add the ricotta, kefalograviera, eggs, breadcrumbs, nutmeg, pepper and oil. Mix with the fork to combine. 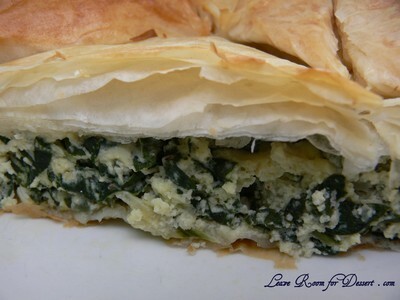 Add the spinach and set aside while preparing the pastry case. Preheat oven to 180C. Lightly grease a 20cm x 30cm x 5cm deep baking dish. Lay the filo out on a bench. Cover with a dry tea towel then a damp one to keep it from drying out. Line dish with a sheet of filo and butter the filo. 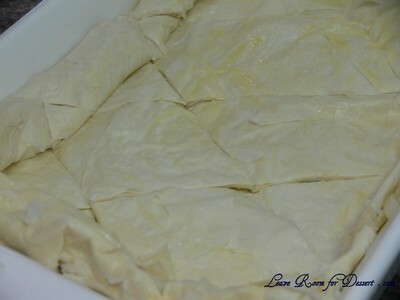 Top with another sheet of filo and butter and continue until about half the sheets of filo are used. 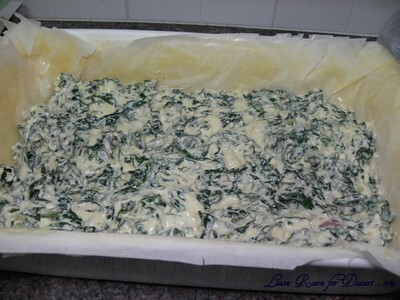 Using your hand or a large metal spoon, gently mix the spinach filling until thoroughly combined. Pour into the prepared pastry base and spread evenly. Top with remaining filo, buttering each sheet, ensuring the final sheet is well buttered. 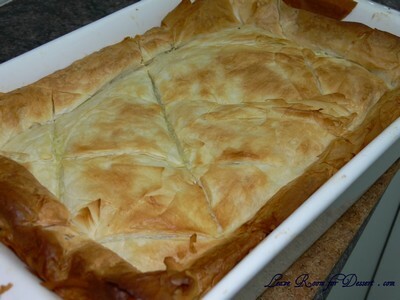 Trim any overhanging pastry and tuck in the sides. Use a sharp knife to mark pastry top into diamonds, allowing the knife to pierce the pastry once or twice to allow air to escape during baking. Sprinkle lightly with water and bake in preheated oven for 45 minutes to 1 hour or until well browned and set. 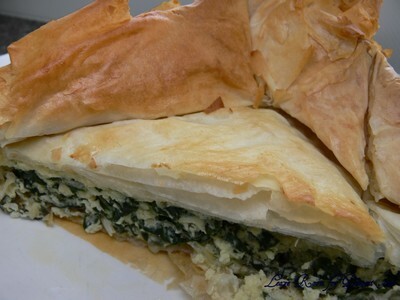 Gently shake the pan and the spanakopita will slide easily when cooked. Cover with foil if over browning. Cool on rack for 15 minutes before cutting to serve. Note: The spinach can be prepared a day ahead. 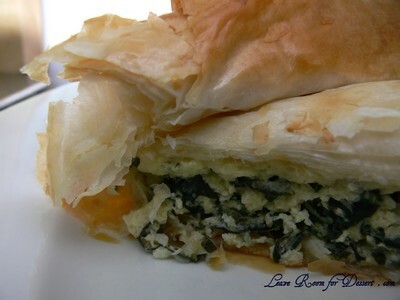 It must be as dry as possible to ensure the spanakopita does not become soggy. I wanted to create something quite special for my wedding anniversary. I didn’t get to eat much of the wedding cake on the day, or the day after, and I’m not sure how well it will have kept from a year ago (as we froze the top layer of the cake). We had a white chocolate hazelnut cake for our wedding and for more than a year I have been wanting to make one. 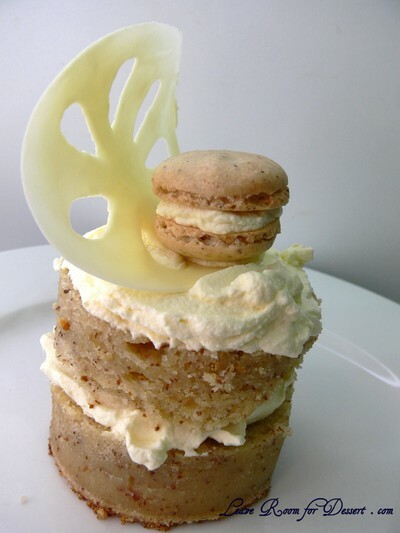 I decided to make some hazelnut macarons and white chocolate rings to add some depth and interest to the cake. Both the mud cake and macarons tasted fantastic. The mud cake had subtle white chocolate and hazelnut flavours, without being too sweet. It was moist and kept very well. 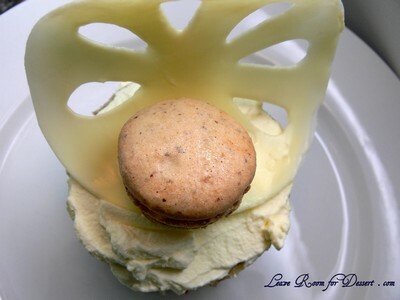 The macaron had a lovely noticeable hazelnut flavour, perfectly chewy on the inside and slightly crispy on the outside. The macarons were left to form a shell, and I’m not sure whether it had too much moisture or hazelnuts to cause cracking of the top of the macaron or whether the oven played any part in this. My tempering wasn’t perfect, I heated 2/3 of the (180g block) white chocolate to 43C over a double boiler, added the other 1/3 and cooled to 29C (which took a while) then heated to 31C. The white chocolate still snapped when set, but wasn’t as shiny as I’d hoped. To make the white chocolate rings, I cut out strips of projector film, coated them in tempered white chocolate, let them set for a bit, then curled them up in a circular cookie cutter. For the flower ring, I punched flowers out of the film using a craft paper puncher. 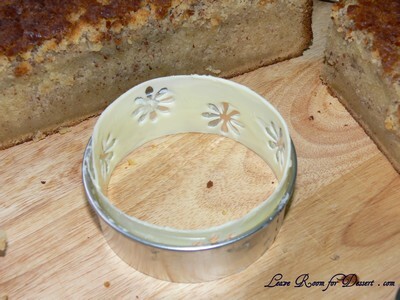 Grease and line a 23cm/ 9” round cake tin (use a non-spring-tin as it will probably leak a little). Preheat oven to 170ºC, 150ºC fan forced. In a saucepan over low heat, heat chocolate, butter and water. Stir frequently until melted and smooth. Remove from the heat and cool slightly. In a large bowl, lightly beat eggs. Gradually beat cooled chocolate mixture into eggs. Whisk sugar and flour into chocolate mixture, continue until smooth and well blended. Pour mixture into cake tin. Cook for 1½ to 2 hours (the recipe says 45 minutes, but this was way too short for my oven) or until skewer inserted into centre of cake comes out clean. (Cover with some foil if the cake is browning too much on the edges). Turn cake onto wire rack to cool. Spread top with chocolate ganache when cooled. Put the white chocolate and cream in a bowl and microwave on high for 1 minute, stirring half way through. Stir until smooth. Allow to cool for 15 minutes. 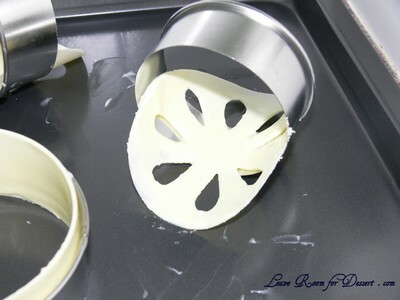 Using an electric beater, beat the white chocolate mix for 2-3 minutes. 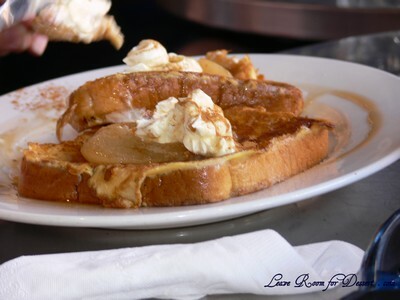 Add extra cream to help cool down the mix and help it thicken easier. Beat on high for 2 minutes at a time, scrapping and observing the texture. Once it is nice and thick cover the cooled cake with the ganache. Sift the icing sugar with the almond meal and hazelnut meal – discard any large bits. Beat the egg whites until soft peaks form. Gradually add the caster sugar while continually beating until a thick glossy meringue mixture is formed. Add the sifted icing sugar and meals and stir and fold into the meringue. The mixture needs to be firm enough so it doesn’t lose all the air and structure, and soft enough that peaks are not evident when piped out. 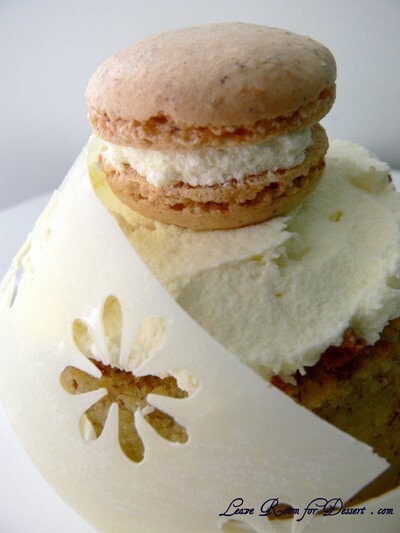 Pipe out macaron mix into 3-4cm circles on baking paper and let sit at room temperature for 30minutes – 1hour. Preheat oven to 170C. 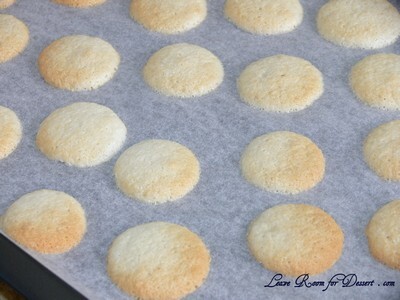 Cook macarons for 15-20minutes until crispy on the outside and chewy on the inside. Let the macarons sit on the tray for a few minutes, before carefully removing them and leaving them to finish cooling on a wire rack. When cooled, fill with white chocolate ganache. I have wanted to try churros for so long. I have only once tried them at a Spanish restaurant and was absolutely disappointed. 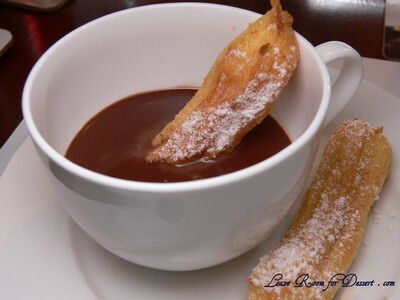 The churros were very soggy and the dipping sauce tasted like a bottle of cheap chocolate sauce used for ice cream. Such high expectations and such a horrible dish – and what’s worse is one of the staff said it was their favourite dish – and she was Spanish!!! 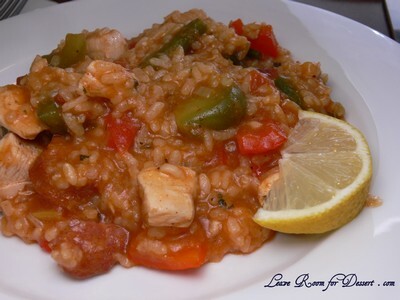 I am waiting patiently to try some at another Spanish restaurant, hopefully this time I will have a better experience. 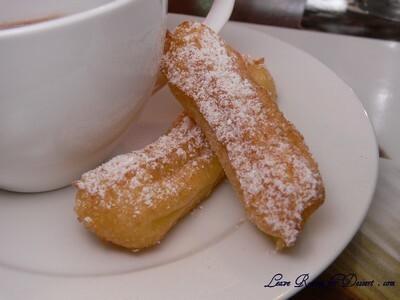 Then came the churros. These were quite nice and I would love to try them again. 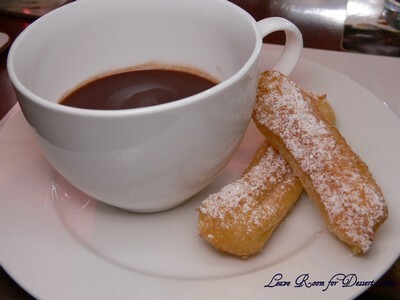 Our biggest problem was controlling the temperature of the oil, too hot or too cold and the churros didn’t cook properly. I also think they were a little thick – I used the biggest star nozzle that came in the piping pack I bought. This seemed to be the perfect size until they doubled (or maybe tripled) in size whilst cooking – although while cooling they did reduce in size a little. All-in-all it was fun and I would definitely make these again. Heat a large, deep frying pan over a medium heat. When hot, add chorizos and cook, stirring occasionally, for 3-4 minutes, until turning golden and the oil has been released. Remove and set aside. Add the chicken in a few sets and cook for 3-4 minutes, stirring, until golden. Remove with a slotted spoon and set aside. Add 1 tablespoon olive oil, then add the onions and cook, stirring occasionally, for 6-8 minutes, until softened. Add the garlic and paprika to the pan and cook for 1 minute. Add the rice, stir to coat in the oil and then add 2 litres hot stock. Simmer for 15 minutes, stirring occasionally. 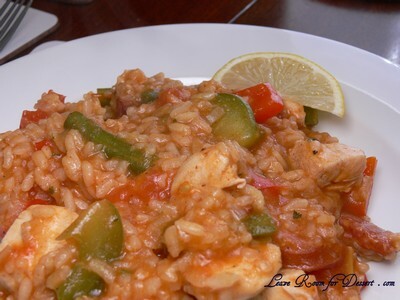 Return the chicken to the pan and add the capsicum, peas and tomatoes. Stir and cook for 5 minutes, adding a little more stock or hot water if necessary. Season and stir the chorizo and parsley into the pan. Continue to cook for 5 minutes or until the rice is just tender and most of the liquid has evaporated. Serve with lemon wedges. 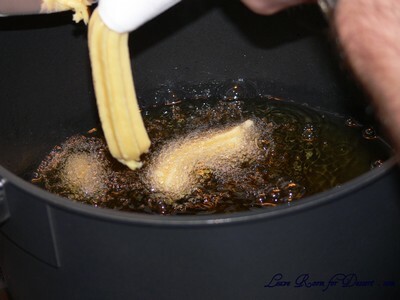 Place vegetable oil in a large pot and start it heating up on medium/hot heat (eventually to 180ºC). Bring milk, water, butter, caster sugar and salt to the boil in a medium saucepan. Add flour and stir to combine. Once combined, stir hard to form a thick dough and continue to cook for 3-4 minutes to cook the flour and remove lumps. Put mixture into a food processor while still hot and turn food processor on. 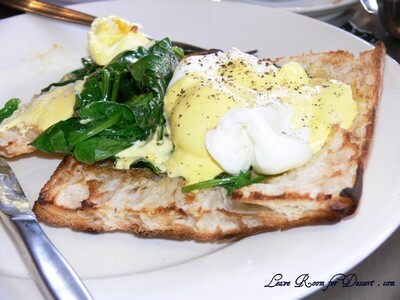 Add whisked eggs and process for 30 seconds until a smooth sticky paste is formed. 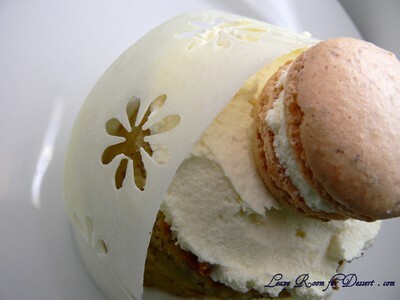 Scoop out and put into a piping bag with a star nozzle ready for frying. For the hot chocolate, place a large metal bowl over a saucepan with simmering water. Place 250g dark chocolate in the bowl. In a separate saucepan, place milk, caster sugar and cocoa and whisk together, bring to a simmer, then pour over the melted chocolate, whisk until smooth. Keep chocolate mixture over water to keep hot, until ready to serve. To fry the churros, either pipe a figure 8 on a oiled spatula and slide carefully into the hot oil (180C), or pipe a line and cut with a knife and fry for 2-3 minutes until golden, they will double in size. Remove from oil and place on paper towel for a bit, then heavily dust with cinnamon icing sugar mix and serve with hot chocolate. I really enjoyed meeting up with a group of the Daring Bakers in Sydney a couple weekends ago. Audax organised a lunch, which was attended by many bloggers, many of whom I hadn’t met and some that I had. All the bloggers were friendly and knowledgeable, and we shared many stories about baking, the Daring Bakers challenges we’ve had in the past and ones we expect might arise in the future. We also discussed books, restaurants and who the lucky people are who get all the lovely food we make for the challenges and our blogs. It was great talking with like-minded baking enthusiasts, and I would love to meet up again. 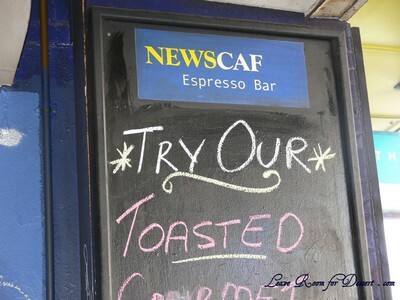 We went to NewsCaf in Newtown for a hearty lunch. I had been contemplating having a croissant for lunch, but after seeing pancakes on the menu (I do love my pancakes), my decision was made. I was also looking forward to some pear nectar, as I thought that would be nice and refreshing, although there was none available. So I decided on the Wildberry Frappe. 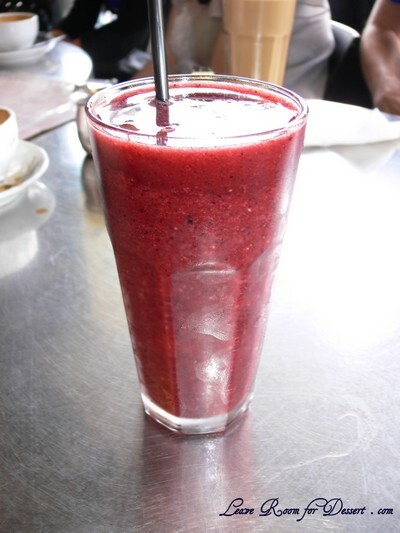 The frappe was nice and fruity, with a slightly sweet flavour and overall strong berry flavour. When my pancakes came out, I was impressed with the generosity of toppings. The two pancakes were covered in a mound of blueberries, strawberries, banana, ricotta and maple syrup. The flavours worked very well together. 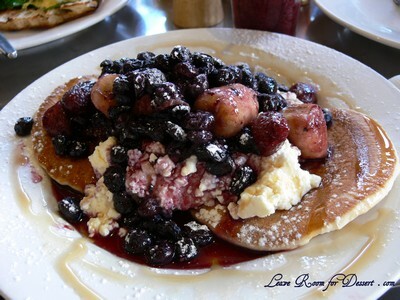 I love ricotta with pancakes, and the bananas and tartness of the berries complemented the sweet maple syrup well. The only thing I could have asked for to improve it, may have been a touch more maple syrup – I tend to have quite a bit on pancakes. Everyone else’s meals also looked very generous. 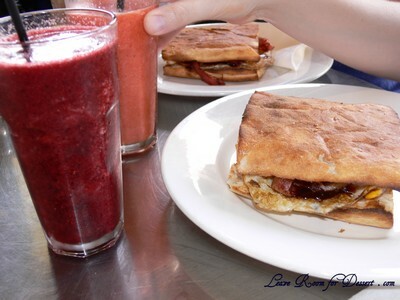 Bacon and egg rolls, croissants, eggs benedict’s and French toast were some of the other meals ordered. Thanks again to Audax for organising the meet up. It was great to finally meet you and many other enthusiastic Daring Bakers.